Historians and town officials are eager to excavate the remnants of a vessel more than 100 years old that was discovered on a New Jersey beach by drillers preparing a protective sea wall in the wake of superstorm Sandy. The discovery could be nothing more than an old barge, but some officials believe it is a much more historical sailing ship from as far back as the 1850s, and at least one has a hunch that it is the skeleton of the Ayrshire, a Scottish brig that crashed on to a New Jersey sandbar in 1850. John Ducey, the mayor of Brick, suspected construction workers would find something while digging through the beach. Lumber, certainly, possibly even an old car, he said. "I was shocked," he told ABC News. "I thought it was kind of cool that a ship from the 1850s was 20 feet under the sand." EIC Associates, contractors hired by the state, had spent the last four months building a steel wall along the New Jersey coastline to protect against hurricanes and severe storms when one of its rigs, a drill-like machine, burrowed into the sand and broke upon hitting something last Tuesday. The crew dug through the sand, coming across the thick timbers of the vessel. The New Jersey Department of Environmental Protection is not sure what they've found, saying it could be a ship or a barge. It did confirm though that the boat was designed before the 1900s due to its peg-like construction, a style of ship making that predates the early 20th century. "A ship has much more historical value than a barge," said Bob Constantine, a spokesperson for the DEP. "It could very well be a ship, but we don't know yet." EIC Associates declined to comment. 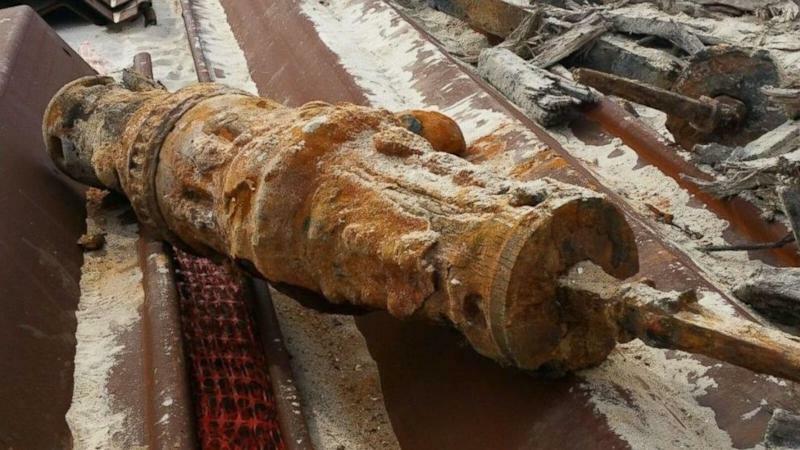 The remnants consisted of timber and debris along with an intact windlass, a device used to release the anchor and lines of a vessel, according to Daniel Lied, an expert at the New Jersey Shipwreck Museum in the InfoAge Science Center. He says that because the windlass was found on top of where the deck was, there may be more ship underneath it. "It leads me to assume there's a lot more vessel down there," he said. Shipwrecks were a common occurrence along the New Jersey coast between the early 1800s and early 1900s, happening "once a week on average," according to Lied who called the period the "heyday" of shipwrecks. Lied said that if the remains are from a ship, they could potentially match those from one of 12 wrecks. One of these wrecks is the Ayrshire, a Scottish brig that went down after hitting a sandbar on Jan. 12, 1850. The sandbar that it struck is today part of Manasquan, a new Jersey area next to Brick. The sinking was historical because it marked the first time the Francis life-car, a metal life raft with a roof was used, according to Lied. The life-car which saved 199 of the 201 British and Irish immigrants on the Ayrshire, was acquired by the National Museum of Natural History in 1890. "The first time it was ever used, and it was used quite successfully," he said. "If this wreckage is indeed the remains of Ayrshire, that makes this wreckage highly historical, one of the most historical ship wrecks in the U.S."
New Jersey hired EIC Associates in July with a $23.8 million contract to design and build a 3.5 mile-long steel wall to protect vulnerable areas from hurricanes and severe storms. The project was an effort to protect areas that were severely damaged by Hurricane Sandy in 2012. Constantine said work on the wall is proceding in other areas and that that the area where the buried vessel was found is small and would not have a huge impact on the length of the project. If the vessel is indeed a ship, it will be recorded in the New Jersey register of historical places. "Once we have a marine archaeologist look at it, we're going to probe into the ground, get a sense of how big the area is, and then we'll go from there," said Constantine. A marine archaeologist has been hired to examine the remains over the next few days. "Something like preserving a ship is important," said Ducey. "So if it delays the project a bit, I have no problem with that."